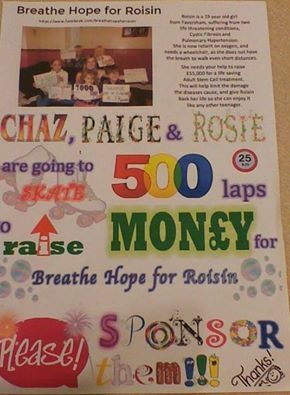 Chaz, Rosie and Paige are doing a sponsored Skate to raise money for “Breathe Hope for Rosin” on Saturday 6th December 2014. This will take place at Abbey Sports Centre, from 11am. We would like to thank Abbey Sports Centre and their staff for their generosity in providing some time on Saturday free of charge for this very worthy cause. Sponsor forms are available at all training sessions for anyone wishing to sponsor the skaters for this event.